I don’t know about you, but I am loving the fair isle sweater trend this winter! They are a fun way to spice up your winter wardrobe. If you are like me and have been eyeing this trend, then this post is for you. For a little fashion inspiration, I am sharing how I recently styled a new fair isle sweater with all the outfit details. Plus, I found 11 cute and affordable fair isle sweaters worth adding to any winter wardrobe. The fair isle sweater I am wearing is from LOFT and is currently 50% off! I styled my sweater with ripped jeans and a western style bootie for a bit of a unique twist. Also, my handbag is a new purchase that I have been loving. It was the perfect size for our recent trip to Europe, and the oxblood color goes with so many things. It comes in three other pretty, neutral colors, that are super tempting to get given its affordable price! Of course, on colder days I would throw my go-to parka (also on sale right now!) over this outfit to stay warm. Hover over the sweater below to see the price. Most are under $25!! Now, I would love to hear from you all. Are you digging the fair isle trend? What is your favorite sweater of the ones I shared? I would love to hear what affordable pieces are in your wardrobe for this winter too. Disclaimer: All the opinions and thoughts I share are my own, unless stated otherwise. I only share content that I have a personal connection with. Your clicks, comments and engagement are very much appreciated, and may allow me to receive a small compensation. 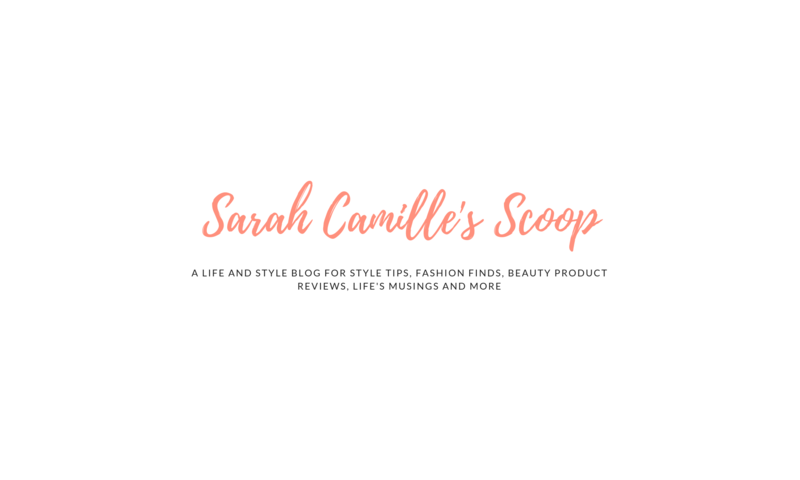 Your support of Sarah Camille’s Scoop and the brands I share help me keep doing what I love — thank you! Those are some beautiful sweaters. I wish I could get my daughter to wear them. She just doesn’t like the collar I don’t think. Maybe one with a lower cut on the collar. I love that this trend is back! I was a fan of it back in the day (25 years ago, ehem…) when this kind of sweaters were trendy! Yeah! It’s so fun to see trends come back. If you saved sweaters from back then, I’m jealous!! Wonderful suggestions! I like these stylish sweaters and the color combinations. Love your casual outfit as well! I actually don’t wear sweaters all that often, but these ones are great deals! Okay, I could buy all of these sweaters right now. They look so cozy and such fab designs. I love sweaters. They are cozy and comfy. The most that I’m reaching for during wintertime. I agree now is the right time to buy it because the sales are here. Sweaters are totally a staple this time of the year. I love to feel super cozy when the weather gets cooler and these are so very cute. Oh gosh…I had sweaters like this the last time they were “in vogue”! (blushes) – so no, not digging so much this time – the older I get, the more I strive toward a capsule wardrobe of classic looks that won’t need updating every 6-12 mos. BUT, that said, I love how you’ve styled these – those booties are must-have! I love the designs on those sweaters. The thing is we rarely have sweater weather here. These are such cute sweaters! I couldn’t wear any because I have to have a low neckline so it doesn’t bother my thyroidectomy scar, but luckily I live in south Texas so we don’t need sweaters very often. But if I could wear them, my favorite is the one you have on! I love winter sweaters! These are such cute options! I wonder how soft they are? I have a fair isle turtleneck sweater and I’m obsessed. When I first got it I was a little hesitant to wear it, but now it’s a favorite. I’m definitely digging these sweaters! I am ALWAYS cold, and living in Canada in Winter you need good warm sweaters. I would wear all of them! I absolutely love these ideas for sweaters. Here in vegas we don’t use them often but I would love to get my hands on all of these. Especially the blue amd green one! Previous PostPrevious Q&A for 2018: Reflecting on Favorite Moments, Biggest Challenges & More! Next PostNext Hello Good Hair Days: Customized Shampoo & Conditioner + Giveaway!